There were special screenings for sailors stateside and promotional events abroad. There was a massive marketing campaign that involved sandwich shops and soda makers. There was a positive review from Military Times’ octoplex guru. There was a cameo by the Navy Department’s top civilian. Despite all that, and despite an overseas box office take worth more than $220 million, movie-industry reports are pretty much unanimous: “Battleship” bombed. Deadline Hollywood reports a $25.3 million take for the film over its debut weekend in U.S., well behind “The Avengers,” which topped $55 million in its third weekend. 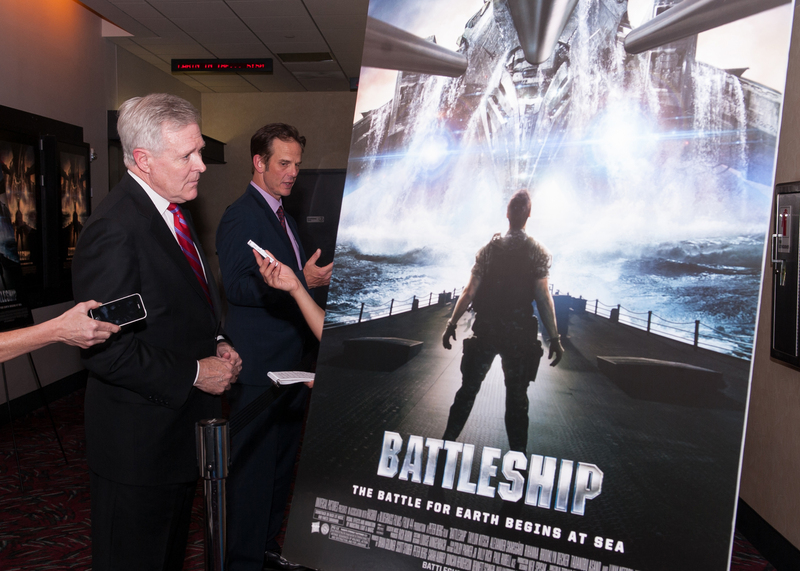 One analyst quoted in this Reuters report said “Battleship” needed to hit $50 million in its opening weekend if it wanted to break even on production costs that topped $200 million. The numbers are low enough to drag down profits for the movie’s studio, Universal, owned by media giant Comcast, according to the Reuters report. The studio makes back about half the money from each ticket sold and even less on overseas tickets, according to Reuters, so $245 million in sales on a $200 million release doesn’t add up to movie magic. Box Office Mojo, which tracks ticket sales in-depth, reports “Battleship” fell short on opening weekend no matter how you measure it: It was beaten in opening-weekend take by other toy-based movies (“GI Joe: The Rise of Cobra” and the first “Transformers”), other alien invasion movies (“Cowboys and Aliens” and “Battle: Los Angeles”) and even other special-effects-laden disasters (“John Carter” took in $30.2 million its first week). In other words, Navy officials hoping for a cameo in “Battleship 2: Battleship Harder” may have a long wait. It deserves to lose money. Battleshit. I saw it and was not impressed. For all of the involvement from the Navy, there were some major issues with basic things like rank recognition. Overall, dont waste your time. I saw Battleship yesterday: Very disappointing. It was randomly put together, only about four characters in the whole thing really do anything, and for Navy Vets it takes too many liberties on how the Surface Fleet operates. So… it was really only made for civilians and non-military types but you could hear civilians snicker at how far-fetched a lot of scenes became. Music was random and did not fit the scenes: A dark, suspenseful moment in the movie randomly comes up and then music like “Hotel California” comes on helping to ruin the suspense. Actors couldn’t even say “roger that” correctly or to the right people. For example it is said to the girlfriend?! The characters themselves do not mesh well; they all seem disconnected making scenes off putting. Being a Navy / Sci-fi movie fan this was a complete bummer, I was truly hoping it would rock. Recommendation: Just watch the trailers – they rock and are the best parts anyway, maybe even rent it just to put the check in the box. I was told that the best thing to do here is to wait until it came out on DVD. … and then don’t rent it. It deserves to lose money. Right.. That is the best course to take! To my surprise the movie was much better than I expected. It’s the Mabus curse. Everything the SECNAV supports (LCS, bio-fuel, NWUs, and now “Battleship”) turns to poo. Everyone’s taking it too seriously. Come on people, it’s a movie based on a board game. Really? You’re going to take it to task given that known premise? It was a spectacle, but it featured great CGI, Brooklyn Decker (!) and heck Rihanna even made the Navy blueberry working uniform look good, so overall, it will likely make my “Guilty Favorites” list. It would be great if special effects were the only thing required to make a good movie- then this one would have rocked!